Let me tell you a short story. My close friend who topped our class all through senior secondary school was a Muslim. While we shared the awards almost evenly, he comes out overall best, always. I felt insulted. How can I be in a class, and a Muslim will be the overall best. I spied on him and discovered his secrets. At least I thought I did. He writes a few Arabic words on the first page of all his scripts. So I decided to write IJN, an acronym I chose for In Jesus Name on all my scripts. Nothing beats the name of Jesus, I said to myself. That year, not only did Tope come out as overall best again, he beat me to awards that I used to collect and added that to his collection. Tope knew how to answer questions better. He was obviously smarter. He studied more than I did. He was more detailed than I was. In almost everything as a student, he put in more efforts than the rest of us. I hoped to be better just because I wrote IJN on my scripts. I was wrong. Wisdom is the principal thing. Get wisdom. In all thy getting, get understanding. 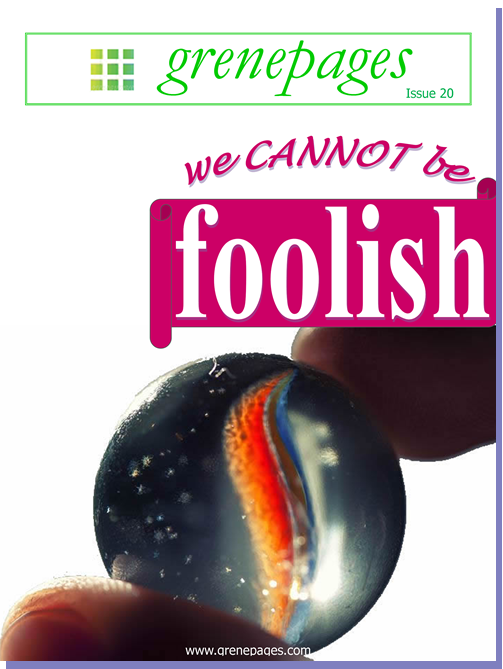 In this our 20th issue, let’s take a look at how we can fit into God’s plans wisely. We can’t be foolish. Welcome again. This is grenepages! This entry was posted in grenepages and tagged editorial, issue 20. Bookmark the permalink.